OPEN TO LAST MINUTE SHORT STAYS IN HIGH SEASON! GREAT FOR SMALL FAMILY GATHERINGS OR GIRL'S GETAWAYS! A one-of-a-kind experience in Prince Edward County, this artistically restored 1876 School House has all the modern conveniences while providing a very comfortable and beautiful setting to get away from it all. 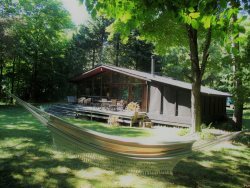 Dahlia House is perfect for girl's getaways or family gatherings, sleeping up to 10 in 4 bedrooms, with a view of the Bay of Quinte, magnificent sunsets and surrounded by exquisite flower gardens in the summer. A large eat-in kitchen (seating 10) forms the heart of the house. With full kitchen and all sorts of foodie implements including a pasta maker and ice cream maker, you will find everything you need for preparing both intimate soirées and group dinners. Featuring recently refinished wood counter-tops, new appliances for 2017 - Kenmore stove with convection oven, Whirlpool refrigerator, Kenmore dishwasher, microwave - and large sink; you are sure to savour the meals created in this inspiring environment. In summer, pick herbs and tomatoes from the garden to add freshness to your creations. Relax in the light-filled “school room” with its restored original windows and 20ft high cathedral ceiling, comfortable couches and space for reading, connecting to WiFi or enjoying one of an enormous selection of DVDs on the 47” flat screen TV. Artistic touches abound from the owner's globe-trotting award-winning quilt to hand made pottery and cutting boards. There is central Air Conditioning to keep things cool when it gets hot. There are 2 bedrooms on the main level. One with double bed and one with twin Bunks. Off the kitchen, find a 3 piece washroom with spacious walk-in shower. Upstairs are 2 more bedrooms across a walkway from each other for added privacy. The master bedroom is beautifully lit and has 2 queen beds and artful accents. The other features 1 queen bed and sitting area. There is a 3 piece bathroom here with claw foot tub. All beds have 100% cotton sheets, duvets and quilts except for the Twin beds which are poly-blend. Out back, enter a “wooded sanctuary” with enough space for everyone to spread out and relax. A Maple-shaded tree house with swing, hammock, sand box and trampoline are sure to keep the kids entertained while you enjoy food and drinks. An iron basket once used in a canning factory serves as a fire pit and is sure to bring your group together with some magical memories to take home. Make use of a new Master Chef 5 burner propane bbq plus a charcoal bbq as well as 2 picnic tables, chairs and a chaise lounge for additional seating. There is a quiet side road for walking and a lovely park just down the road. Bring kayaks and bikes. There is secure storage for guest bikes. Paddle in the bay area just a short walk down the road through the newly cleared marsh or take advantage of the excellent cycling in the area – particularly on Big Island. A Sandbanks Park Pass is included with your rental. This property is water VIEW. The Northport / Centennial Park is just down the road with swimming off the dock. 1417B County Road 15. PLEASE NOTE: the owner lives onsite in an attached carriage house and you share the parking area. Otherwise you have your own private entrance, patio, yard and complete house with all amenities. PLEASE NOTE: there is no laundry usage at this property. There are public laundry facilities 15 mins drive away in Picton. Staying at the Dahlia House was so much fun. The owner is very kind and quickly reactive to any tiny issues or concerns we may have experienced during our stay. The place is so clean and cozy. I would definitely consider staying there again for a nice getaway. We were a pretty large group but never felt crammed! It was very spacious and the backyard space is beautiful. With a car you can get anywhere within 20-40 mins but at night it's nice to be removed and secluded from the noise. Long story short: great place, great host, would recommend! Je la recommande fortement. Danielle est trs accueillante. La maison est superbe ! Avec tous pleins d'quipements dans la cuisine surtout. C'est spacieux, lumoneux, calme. Grateful for the lovely house, flowers and trees! Delightful. We loved how stocked the kitchen was with every dish and utensil we could have ever needed to create lovely group meals while we were there. We LOVED the house itself and the fishies - it was very homey, and the bedrooms were super cozy. We also wished we'd spent more time there so we could have made better use of the huge and sunny backyard. And the trampoline! You simply must visit. Great place. Historical, and well renovated with gusto. Great location. With lots of amenities on site (loved the trampoline). The service is phenomenal and the owners were very relaxed and they give you total privacy. Everything to relax and eat well. Everything was almost perfect. Air conditioning system would have make it the paradise. This family of 10 came together to this beautiful home to celebrate and appreciate. We celebrated the 50th wedding anniversary of Mom and Dad. So, we enjoyed some family time, great food and gathering memories. We gathered around the fire pit to ask 50 questions of the happy couple. We reminisced and learned new things! Thank you for the beautiful place. We loved being surrounded by this home to share in all we appreciated. We had a great time at this place! We do an annual friends cottage trip to Sandbanks and Vicki's Veggies Tomato Fest, and had a great time! Really enjoyed the fire pit and large country kitchen! Very nicely decorated - and gracious hosts! Thanks for leaving the tomatoes and basil! This property has a view of the bay and the magnificent sunsets. The backyard is a private wooded sanctuary. There is a side road for walking and a lovely park just down the road. Kayaks can be paddled in the bay area and through the newly cleared marsh. This area is excellent for cycling, particularly on Big Island. There is no washer and dryer at this home. Public laundry is found 15 mins drive south in Picton. This property runs on septic. Please only flush toilet paper down the toilet or backup can occur.